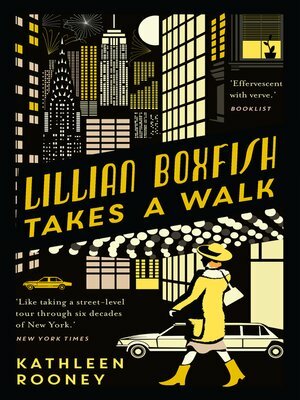 When 85-year-old Lillian Boxfish steps out of her apartment on New Year's Eve in 1984, little does she know she's about to embark on a journey across the whole of Manhattan. But Lillian is no ordinary 85-year-old. On her arrival to New York in the 1930s she took the city by storm, working her way up from writing copy for Macy's department store to become the highest paid advertising woman in the world. Now, alone on New Year's Eve, her usual holiday ritual in ruins, Lillian decides to take a walk. After all, it might be her last chance. Armed with only her mink coat and quick-witted charm, Lillian walks, and begins to reveal the story of her remarkable life. The trouble is, once she starts walking she finds she can't stop. On a walk that takes her over 10 miles around the city, Lillian meets bartenders, shopkeepers, criminals, children, parents, and parents-to-be, while recalling a life of excitement and adversity, passion and heartbreak, illuminating all the ways she and New York have changed - and endured.